I met up with Tiger neighbours Adrian and Sophie at the pub to watch this one. 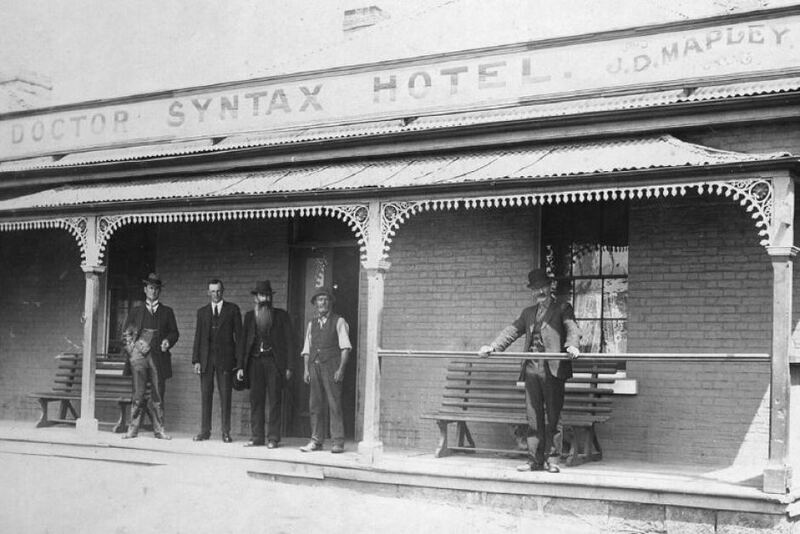 The Dr Syntax Hotel is the spiritual home of the late lamented Sandy Bay Football Club. (It has carried this name since the 1890s and I think it’s named for a racehorse). That’s Kam McIntosh at far right. 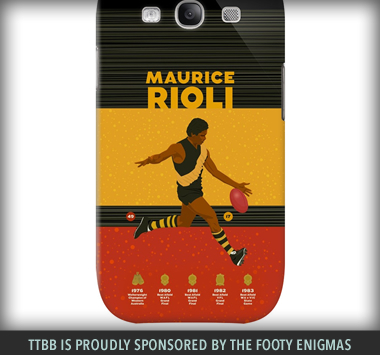 Things got off to a flyer when the barman shouted me my first beer because he liked my Maurice Rioli shirt. 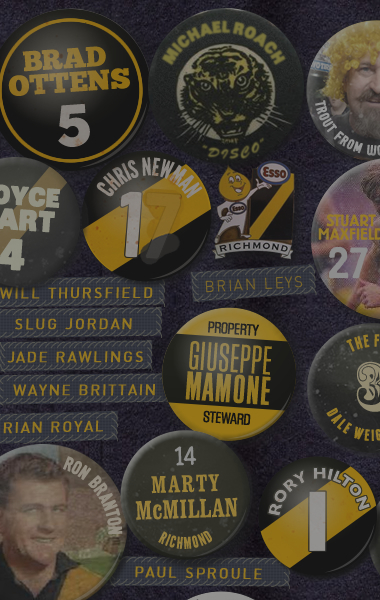 He wants to get a framed Rioli print to complement all the SBFC Seagulls memorabilia. 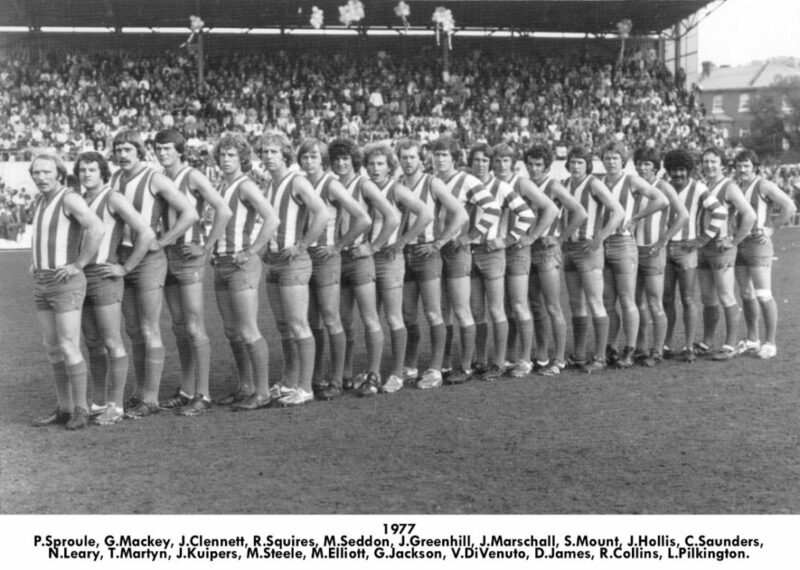 The Seagulls 77 premiership side line up behind captain-coach, former Tiger Paul Sproule. 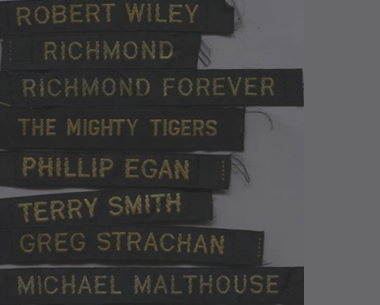 8th in line is 1980 Richmond premiership player Stephen Mount. Adrian and Sophie were coming from an auction. 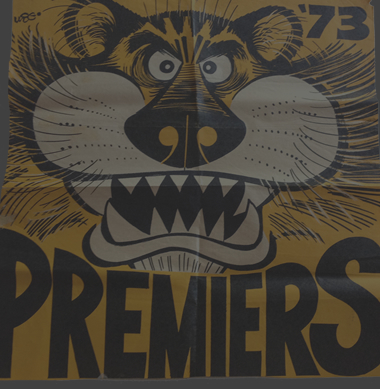 They bought some chairs and were very keen on a display cabinet but Adrian tipped that the bidding process would cost him the whole first quarter of the footy – so they so withdrew. 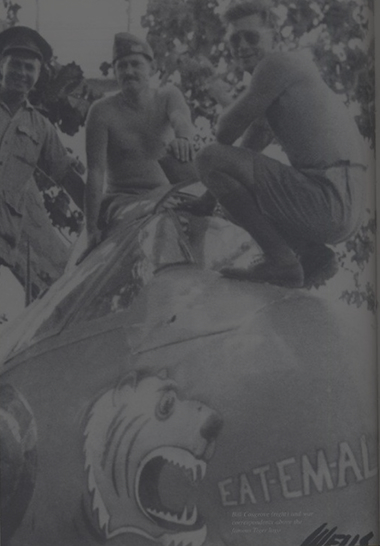 There were about a dozen Pies at the pub outnumbering a handful of Tigers, and all of us toey as a Roman sandal. When George opened the scoring from a set shot you could feel 100,000 Tigers across the land breathe easier – his yips have been a concern. George marked outside 50 and handed off to Shorty who bombed it from all of 60. 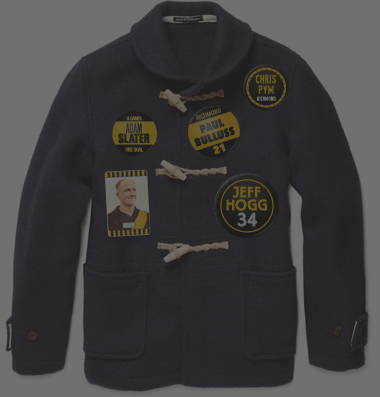 All Pies would have turned to Varcoe and said “your man – don’t let this happen again”. It did, 90 seconds later, this time the assist came from debutant Liam Baker. The young man had a great chance to kick his first minutes later, and dragged it left. Towner chased a ball into the right forward pocket and honestly looked as slow as a wet week. In the pub an 80 year old in a flat cap crossed slowly in front of the TV on his way to the pub TAB and I wasn’t the only one who said “Towner”. A highlight was a magnificent Dusty kick to Jack’s advantage. to mark and goal. Dusty started slow under Greenwood’s thumb but was now wriggling out. He kicked goals either side of half time. The Grimes and Broad chase on Stephenson got the pub on its feet. The Pie wrong-footed Broad and then steamed away from him, to the delight fo the black and white. Ran and bounced three times. Grimes enters the frame before the second bounce and mows down first his teammate (“F&%$ off out of the way Broady!”) and then the opponent, getting just enough pressure on the kick that it’s OOF. Magnificent football, first-class comedy. This was the Pies’ quarter though. Grundy dominating. What is Jack Higgins? Really? He’s leapfrogged Stengel and Bolton into this side, he’s held his place in that midfield even when he wasn’t kicking goals, and now he kicked the greatest snag of the year. There are about eleven different kinds of great goals and it’s hard to compare the Buddy 55m set shot inside out working back post high to the 6-bounces-3-dummies Mick McGuane type, but I think Higgins just invented a new kind. We are holding them at bay. George gets on the end of a chain following Manic Richmond Pressure™ in the centre, especially from Cotch. 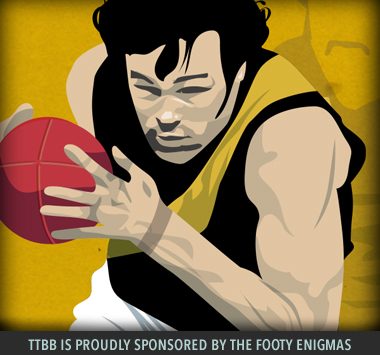 He’s maybe our best but the three BOG are all Pies – Grundy, Thomas and Pendlebury. 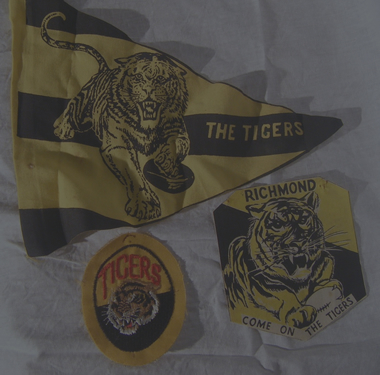 We go to the last change just four points up and at our table we are leaning heavily on the Tiges Great Last Quarter habit to kick in. It’s a Great Last Quarter. 1 minute in Jack takes a pack mark and converts. 2 mins in Jack outpoints Moore and Edwards crumbs, has possession for 0.001 seconds and hands to Towner who goals. 5 mins in Dusty is left one-out with Greenwood – and predictably goals with Greenwood on the ground flapping about like a fish. Edwards and Rioli pile on the pain. It’s a procession, in fact after 3QT you could say its a cakewalk. Extremely even effort – the votes are harder than usual. 4. Astbury … but they do have Astbury as our best on. He’s playing better than Rance at the moment, doing all the great Rance things with never a brain fade. He makes execution mistakes, not decision mistakes. 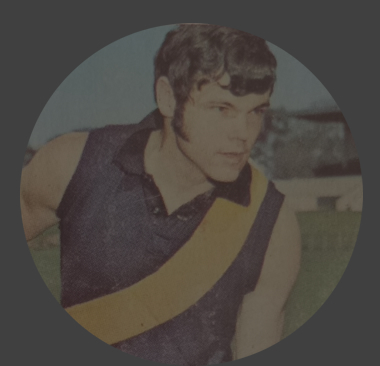 He took a fiercely contested marked running back with the ball where anyone else except Rance would have ‘killed it’ over the line. He’s a rock. 3. 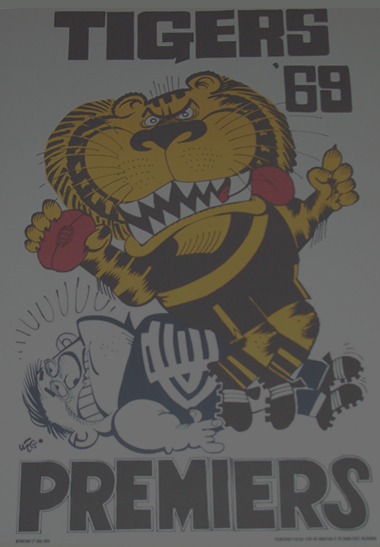 Riewoldt was huge. I think he’s at his peak now, he knows his own game so well and our uncomplicated game plan built around him up front means he is just enjoying his work. 2. Edwards again was too fast, too unpredictable and too precise in disposal for Collingwood to stop him. 1. Short played pretty well but his vote is just down to his 2 long bombs. Gave us a good lead but also a great laugh at Collingwood’s expense. Terrific match report Chris – a lovely read. “As toey as a Roman sandal”.What an aphorism! ‘Twas an excellent game. I love that the best three players on the ground were probably all in Collingwood jumpers but that our boys were by far the best team. The collective effort is so great to watch. Personally, I enjoyed seeing Townsend back in the team and thought he was pretty good. Took some strong marks and did a lot of work blocking space for team-mates, which is one of those jobs easily underestimated. Thanks Malcolm, thanks Tommo! Yes we all love seeing Towner back, his plodding did catch the eye though. Really great that you were right there Tommo – I can see Trout in the pic above but can’t spot you unless you are 2 back from fence, far left black shirt? A great memory to take back to Kenya.